Type location Angola (Camponotus rubripes r. C. Brutus n. stirps, Forel, 1886f: 155, major & minor workers & queen; Mayr, 1895: 150, male) - see below. Bolton (1995) had this as "Raised to species: new status", apparently from being a subspecies of Camponotus solon. .
With a fresh and quite distinctive specimen from the Central African Republic, I have elevated unavailable variety name Camponotus (Tanaemyrmex) lycurgus (Emery, 1899e: 501, worker) from Cameroun to full species status. 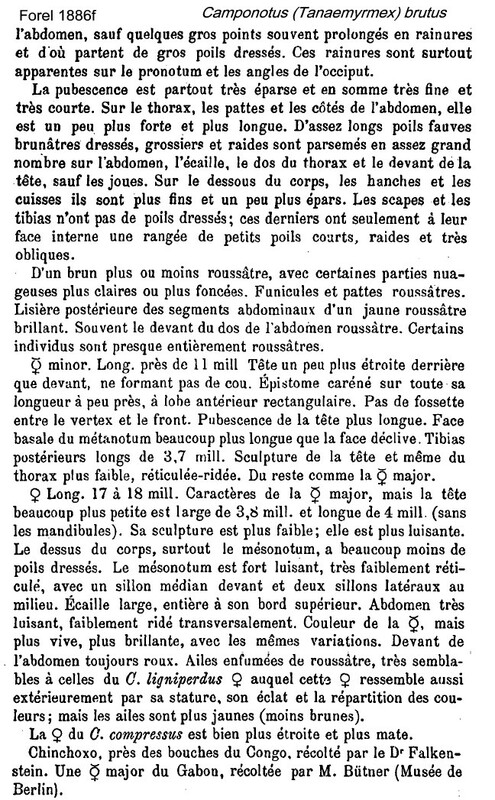 Forel's (1886f) description is at and , with comments by Emery (1899e) at . Forel's specimens came from Chinchoxo, near the mouths of the Congo, collected by Dr Falkenstein; plus a soldier from Gabon, collected by M. Bütner. 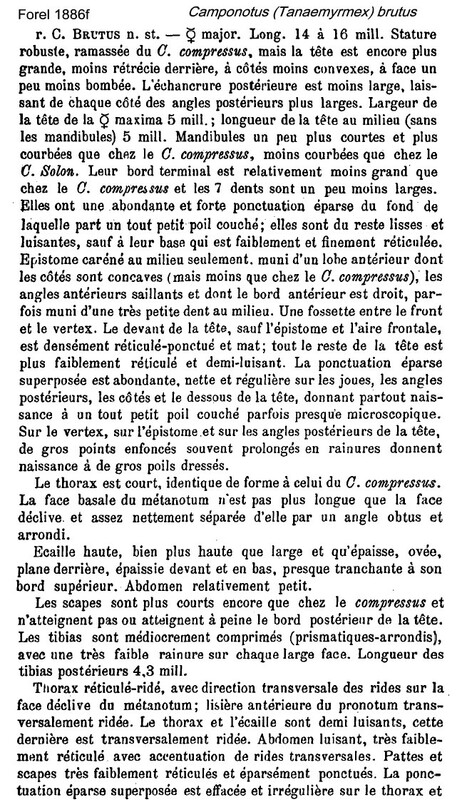 Mayr's (1895) description of the male is at . The specimens were from Senegal and Cameroun. Wheeler (1922) had it as a subspecies of maculatus, listing its denotation as a full species by Dalla Torre (1893: 134). Among the known distribution were Sierra Leone (Samlia Falls, by Mocquerys), Liberia, and Cameroun (Sjöstedt and H. Brauns, at Victoria by F. Silvestri and H. Winkler, at Mundame by Conradt, Nssanakang by Rudatis, Bibundi and Mokundange by Tessmann, and Yukaduma by Schultze); elsewhere were findings in the Congo areas. He noted it nests in rotten wood, and that it was found nesting in an old oil palm trunk. Forel (1911f) reported brutus (as ssp of maculatus) from Zaïre, Kasai, Kondué by Luja; and Lukula by Daniel . Colour dark red-brown, extremities orange, shiny. Erect hairs coarse and relatively sparse. Declivity of propodeum obtusely angled. Petiole a sharp scale. In Nigeria it nests most commonly in large holes in forest trees, with the hole entrance being covered over with matted plant material; also in dead wood on living trees. Occasionally seen foraging on cocoa; also on native trees. Found in Ghana, on the ground and herbs under cocoa at the Mampong Cemetery Farm, and sampled five times in the cocoa canopy survey (Room, 1971); Majer found it in 18.8% of his 144 pkd samples at Kade, with 20-40 workers per sample (1975, 1976a, b, c); and on cocoa mistletoe (Room, 1975). Room (1971) found it to be positively associated with Crematogaster depressa and Tetramorium aculeatum. In their study of the Campo forest canopy, Dejean, Belin and McKey (1992; see also Dejean et al., 2000a) found it on the canopy and midtrunk of 20 of 167 primary forest trees; a sub-dominant tolerated by Crematogaster depressa and nesting in hollow branches or under bark. They described it as nocturnal and, if a normal dominant is absent, being capable of developing polydomous colonies and so occupying the whole canopy of a tree (8 trees). 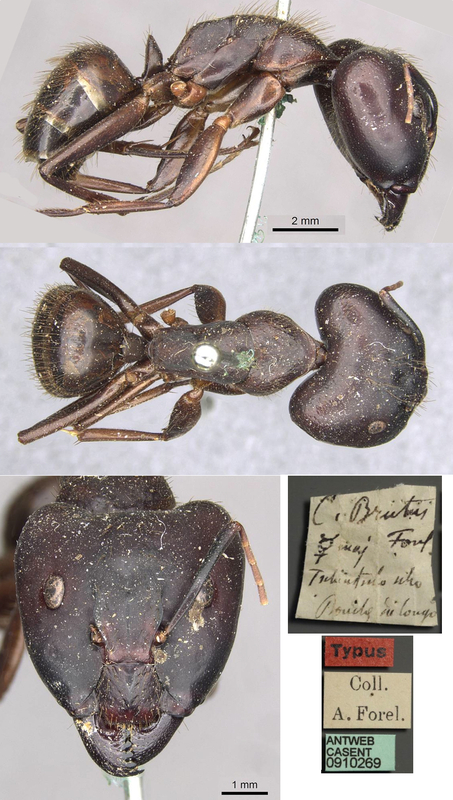 In the absence of dominant ants, C. brutus tended Coccids (Ceroplastes species) and Diaspids (Aspidiotini species, on one each of the trees studied. 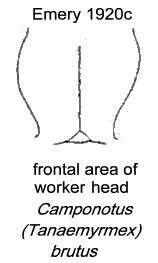 The photomontage of the type major worker is collated from http://www.antweb.org/specimen.do?name=casent0910269. The photomontage of the type minor worker is collated from http://www.antweb.org/specimen.do?name=casent0910270. The photomontage is of a major specimen from Gabon, Pongara National Park, 0°19'336"N 0°19'102"E, 1-8.viii.2006, sweep net in sesame and forest, collector Yves Braet. The photomontage is of a major from the Central African Republic, Dzanga-Sangha Nature Reserve, 02°55’04.8" N 16°10’09.7" E 450m; environ Camp 6; 22.ii.05; in trunk at 22 m collector Philippe Annoyer. Photomontage of a minor from Gabon; Pongara National Park, Pointe Wingombé, 0°19'336"N 0°19'102"E, 9-27.vi.2006, malaise trap at edge of savannah forest, collector Yves Braet. Photomontage of a media worker from the Central African Republic, Dzanga-Sangha Nature Reserve, 02°55’04.8" N 16°10’09.7" E 450m; environ Camp 6; 22.ii.05; in trunk at 22 m collector Philippe Annoyer. The photomontage is of a minor from the Cameroun, Matomb; 3°49' 0 N 11°4'0"E; highland area elevation >500m; Quadrat in fallow; 27.vii.2007; coll. A Fotso Kuate. The photomontage is of a queen from the Central African Republic, Dzanga-Sangha Nature Reserve, 18.ii.2005 18h30-6h Camp 5 02°53'25.9" N 16°10'26.4" E 409 m Sur plate-forme à 40 m du sol dans un Kosipo (Entandrophragma candollei, Meliaceae), collector Philippe Annoyer.